Svínafellsjökull icefall lay in a valley between Svínafellsheiði and Hafrafell. It is an icefall from Öræfajökull which is the highest mountain/glacier in Iceland around 2109 meters high. I spent several nights beneath Svínafellsjökull icefall in May, both 2015 and 2016, recording 8-10 hours overnight recording. I was always trying to capture iceberg breakdown into the glacier lagoon, because last time I record it in 2014 it was disturbed with huge tsunami. But most of the breakdown was probably somewhere between 1300-1700 meters, high in the mountain. Anyway, during the night when traffic goes down and the weather was calm, it was always interesting to listen to the glacier in the „silence“. It starts like a thunder with low frequency rumble, high in the mountains. Then a strange „white noise“ falls slowly down the the wally, all the way to the end of the icefall toe. I am still not sure if it was an echo from the mountain or some crawling sound from the glacier. But it was so slow that I am almost sure that it is was not an echo from surrounding mountains. But this is not what you will hear in the following recording. After one of this overnight recording in 15th of May 2016 I decided to record near to a frozen pond close to the glacier’s toe. The time was around eight o´clock in the morning so the tourist traffic had not began to disturb the soundscape. The temperature was just below zero, but the morning sun was already melting the ice in the area. The soundscape was amazing. With closed eyes it sounds like a busy place with bunch of small elves. Small trickle, ticks and cracks makes the soundscape worth to listen and to record. 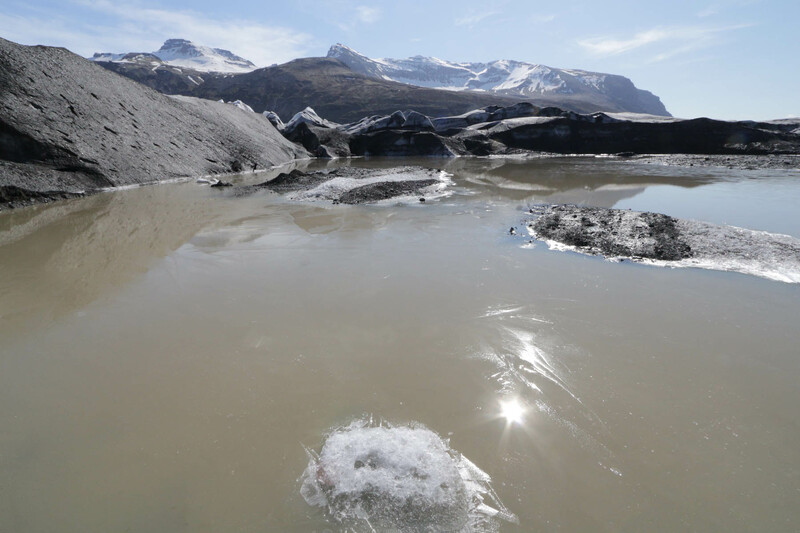 At 17th minute the glacier start to crawl and then again one minute later with low frequency rumble.